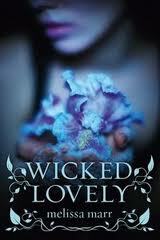 To be honest, I was disappointed after reading Wicked Lovely. After reading Bitter Frost and loving it, I decided to try another book with the same genre. Fairies. Throughout reading this book, I got bored easily, and I would put it down, and was hesitant to pick it back up again. Maybe it was my lack of knowledge for fairies and these unusual creatures, but I was lost entirely reading this book. There was just so much I needed to be filled in on. But after reading Wicked Lovely, I have learned quite a bit of information. Fairies have definitely sparked my interests as something I want to research about (I'm a total nerd). Melissa's way of writing this story was no help either in helping me understand what was happening, in fact, throughout reading the book, I kept wondering what was going on. I was a little disappointed that it wasn't written in each character's POV, but instead it was written over third person narrative. Melissa gets credit for including powerful language though. Aislinn, the main character has the "Sight", or the ability to see fairies while other mortals don't even know fairies exist. Aislinn is one lucky girl to have not one, but two GORGEOUS guys after her, Seth, a mortal and Keenan, the Summer King. Each wanting her to themselves. Aislinn is a very courageous and bold character who isn't afraid to stand up for what she wanted (she reminds me of me! ), and what she wanted was freedom, because she hated the idea of becoming a fairy. She often stood up to the Summer King himself, which made her seem even more suited to rule over the Summer court with Keenan. I have to admit that I felt bad for Keenan, having to see his "queen" be with a mortal, instead of Keenan, the one she was destined to be with! Honestly, I wouldn't blame Aislinn if she wasn't in love with Keenan though. Keenan's flirting skills are terrible with a capital T! Seth would definitely be an ideal boyfriend for any female because he was caring and supportive, and unbelievably accepting when Aislinn told him about her "Sight". Oh, the pain he had to go through for Aislinn. The end was by far the best part. Finding out whether Aislinn was the Summer Queen, the battle between the Summer Court and the Winter Court which is ruled by Keenan's mother, Beira. How can such a heart-filled boy be born from that wretched beast? There were some pretty violent and gruesome scenes in the end, gross enough to make me scrunch my face in disgust. After reading the epilogue though, I was back to being utterly confused which made me really frustrated with this book. So far, this series doesn't exactly seem convincing, which is why I'm not exactly anticipating to read the second book from the series, but if I come across it in the library, I'll definitely borrow it, just to found out what happens next. For some odd reason, this book reminded me of The Lion, the Witch and the Wardrobe. Great you liked Wicked Lovely. Unfortunately I totally disliked it, don't know why, but after that read I didn't want to read any more fairy novels until The Iron King.